The smell of evergreens and baked apples are floating through my house, thanks to my seasonally-appropriate candles. I have Christmas music on, a poinsettia proudly displayed on my end table, and the lights of my tree are twinkling. I love this time of year - the magic in the air is palpable and so is the nostalgia. Who doesn't reminisce or dream about the Christmas morning casserole that you ate every year while cuddling in matching family PJs with hot chocolate in your hands and wrapping paper scattered all over the floor? This is the most wonderful time of the year, and yet there are aspects of the holidays that can be stressful and even a bit forlorn. I say that with the full knowledge that I am abundantly blessed but during the holidays the distance between my household and our family, who all live out of state, seems even further than normal. It's because of this distance that I've gotten creative and found ways to stay connected to those I hold near and dear to me, especially during the holidays. 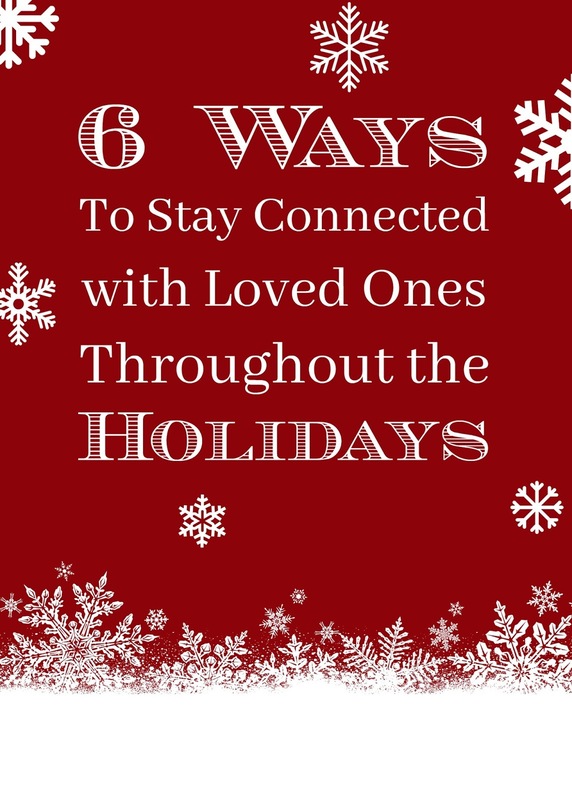 Here are six ways to stay connected to those you love during the holidays. You may not be able to pass a hot cup of Christmas-morning coffee to your loved one, but there's no reason you can't share most of the magical moments of the holidays via video chat. Use your tablet, computer, or phone and set it up in a room, at the kitchen table, or under the tree and make an appointment with your loved ones. A couple clicks, and it's like they are sitting in the room with you. There's something magical about the nostalgia that comes from the taste and smell of a recipe that you've indulged on over the years. Whether it's your Grandma's chocolate pie recipe, your mother's mini ham and cheese sandwiches, or your Dad's secret breakfast hashbrowns, the scent that fills the air can take you back to a time that's nothing more than a memory - bring back all the wonders of days past. You'll feel even more connect to those people and that time if you recreate one or more of those cherished dishes. The expenses of the holidays escalate quickly and often times the cost of travel can be overlooked. If you're able, then consider including travel expenses in your overall holiday budget - sometimes this can be done by eliminating costly gifts. For example, if you're going to visit your parents maybe you give them a less-expensive homemade gift and opt to spend the money otherwise spent on gifts, and allocate it toward travel. Nothing says, "Merry Christmas" like a greeting from a loved one that comes by way of snail mail. Christmas cards are a time-honored tradition because they are beloved by almost everyone. I personally love sharing new pictures of my children with far-away family and friends along with a personalize holiday message. Here's a little sneak peek at our family's Christmas card. And don't fret if you haven't purchased your family's annual card because you still have time to make and customize them. Check out these great Tiny Prints Christmas cards. No matter how far away you might live from your family and friends you can still put a special gift under their tree. Create a custom package with things like homemade Christmas cookies (here's a great recipe), a small gift, a handwritten note, and of course don't forget to include your beautiful Christmas card. Wrap everything up so that the recipient gets the same joy of opening your gift as they would if you were right there with them. Carrying on traditions is one of the best ways of honoring the past and those you love. If you woke every Christmas morning and sang carols around a piano try to replicate that experience. If you opened one gift on Christmas Eve then carry on the tradition. But don't feel bound to those traditions - feel free to make your our traditions with your family. Explore things that you enjoy and teach them to your spouse and children. who know maybe one day they will be the ones who carry on that tradition with their family. How do you like to stay connected to your loved ones during the Holidays? These are some great suggestions!!! I'm all about having dinners and even going out for a drink with family members during the holidays!